The birds are singing, the flowers are peaking their heads out of the cold soil, and it’s time to start baking Spring Desserts! With Easter right around the corner, it’s time to get those lists made of dessert you want to share with your family and friends! 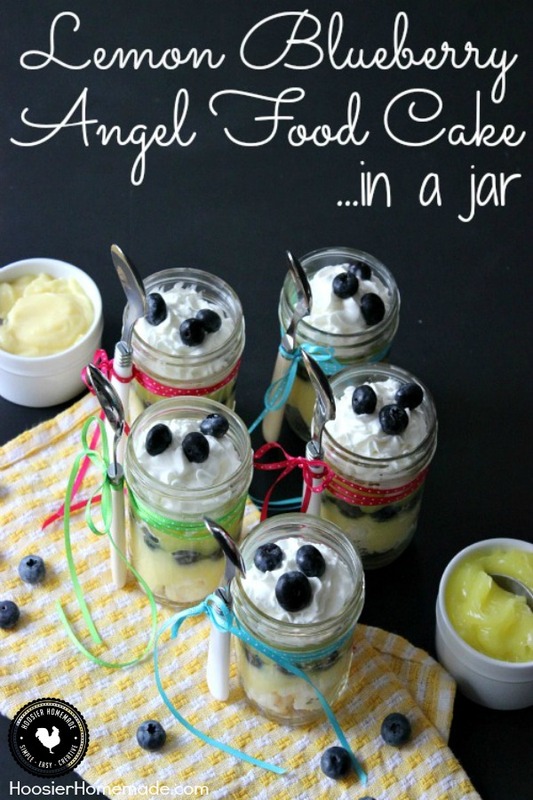 One of the top desserts should be this Lemon Blueberry Angel Food Cake in a Jar! 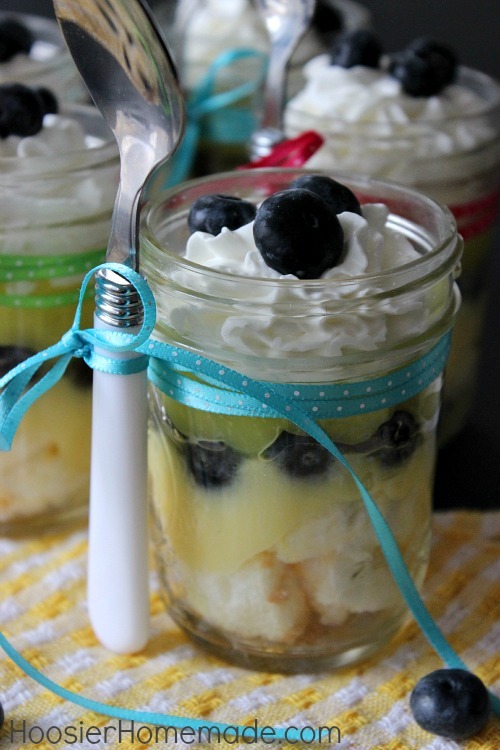 Serving dessert in a jar is not only fun but it’s really quick and easy too! The flavor options are endless as well! Let’s start with the Angel Food Cake, while I have a wonderful recipe passed on from a favorite Aunt for a homemade Angel Food Cake, this time I used a box mix. They are super easy and only need water added. You can bake Angel Food Cake in a variety of pans, the best though is a round tube pan made especially for Angel Food Cakes. You could also go the super easy route and pick one up at the bakery. Then I added a layer of Jell-O vanilla pudding, just a box of instant is fine. 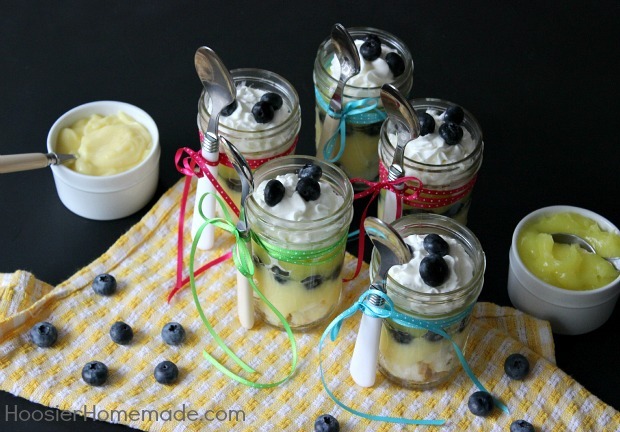 A layer of fresh blueberries were added and then a thick layer of Comstock Lemon Creme Pie Filling. And to finish them off, Reddi-Wip or other whipped topping and a few more fresh blueberries. It doesn’t get any easier than that! I used half-pint size jars. If you are giving them as a gift, leave some room at the top, like I did, to add the lid. Tie with a pretty ribbon and add a spoon. This recipe will fill about 6-8 jars, depending on the size of the jar. You will also have about half of the cake leftover. These are adorable Liz, and I agree, when it comes to angel food cake, the box is the way to go! Thrilled you like the recipe! Thanks for stopping by Sue! This looks almost too good to eat! Perfect spring or summertime treat. Definitely pinning. 🙂 Thanks for sharing with #HomeMattersParty! Hope to see you link up again this week. This is definitely the perfect spring time dessert! 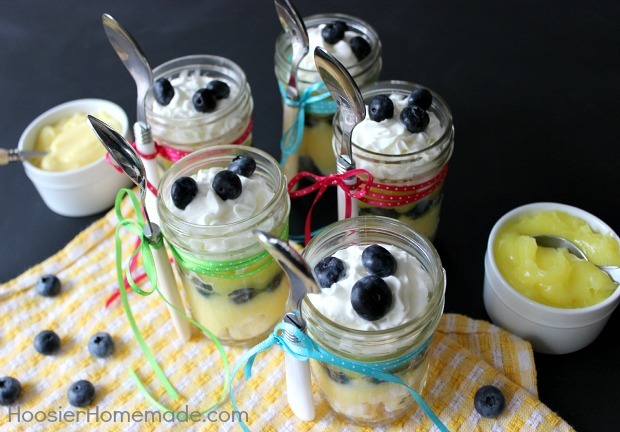 I love lemon and blueberry together and what a cute way to serve a dessert in a jar – yummy! Thanks so much! It is one of our favorites! These look so adorable and so yummy! Definitely going to give them a try! Thanks Leslie- hope you like them! 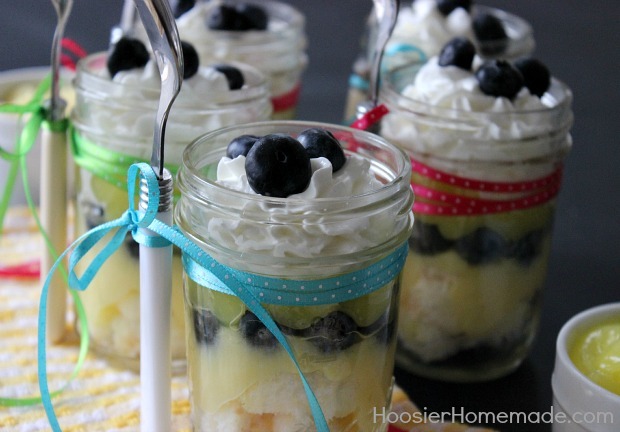 Hi Missi, any size jar will work since you are layering the dessert. I used the half pint jars found in the canning department. Hi Jennifer, I would assemble them the same day. You are right, the cake will get soggy. These turned out so cute, Liz! I love anything in a jar! Yum!! Thanks so much Marla! I’m honored that you like it and pinned!